Our apartments come in three decorative color variations (green, violet, beige) so as each one has its own subtly different layout and character. 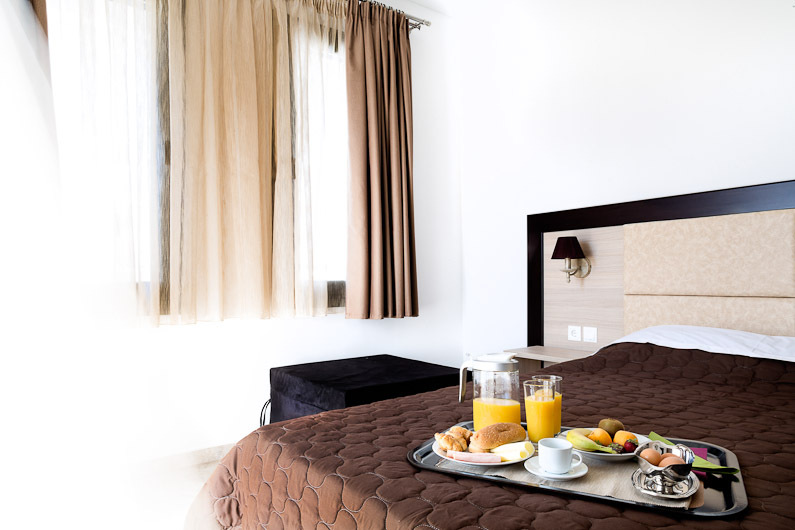 All of them are carefully equipped with handsome, modern furniture which promises to satisfy every need and create a peaceful, pleasant and relaxing atmosphere for our valuable guests. Besides that, individually controlled air-conditioning is available in each studio for better ventilation. Each apartment features a balcony that looks at the front side of Sea Pearl house facing the pool area. 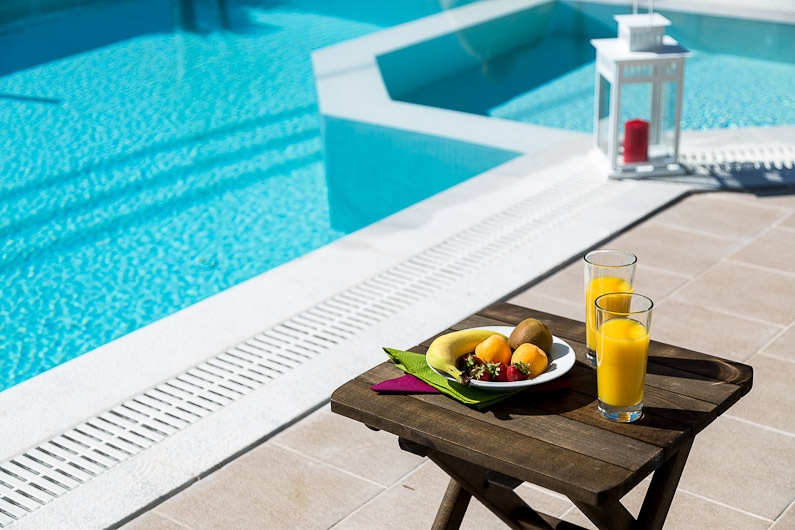 It comes with a pedestal table and beautiful chairs, where one can enjoy the delicious breakfast, a coffee or a refreshment in the pleasant summer breeze. 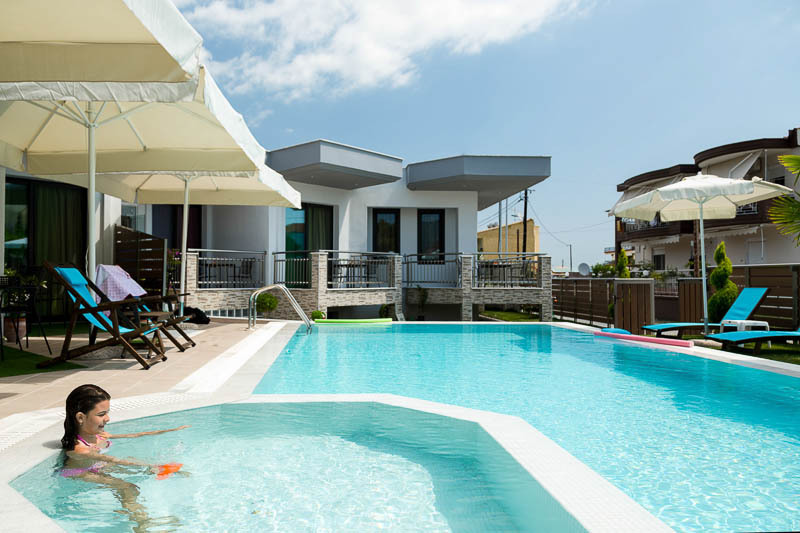 Sea Pearl is a brand new complex (May 2014) of seven modern, elegant self-catering studios for rent. Our studios for rent is a family-run business, with many years of experience in the hospitality sector. 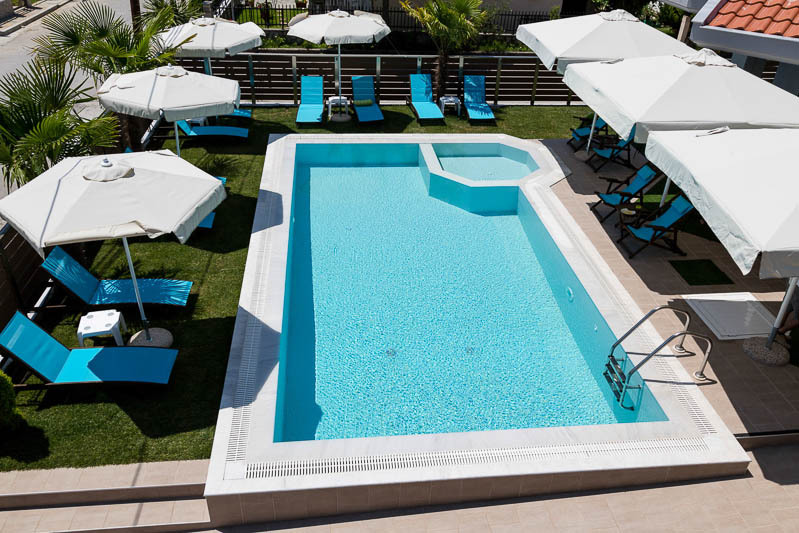 The Sea Pearl is located at the seafront village of Nea Vrasna and features all the facilities and amenities expected of a modern and tasteful retreat as well as a beautiful garden and a large swimming pool that are bound to offer to our guests a truly memorable stay in affordable prices. 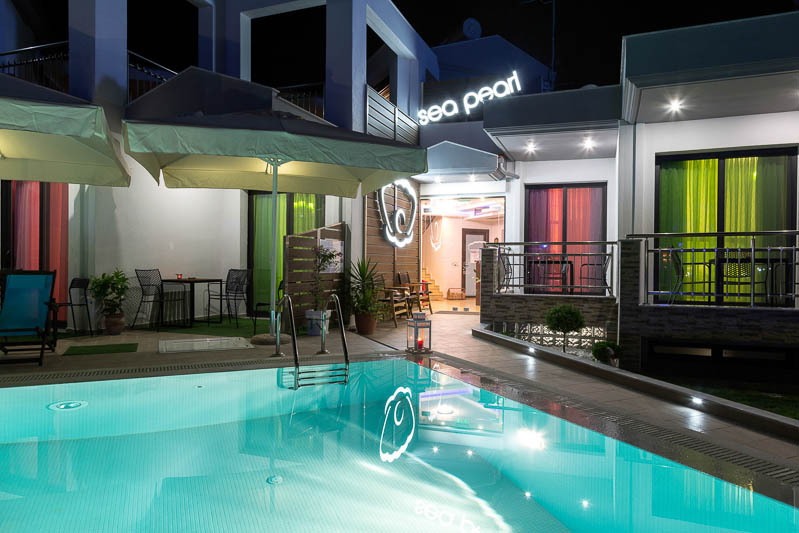 The Sea Pearl apartments for rent offers spacious self-catering accommodation right next to the seaside and is ideal for families or friends who want to experience the wonderful Greek summer the right way. Feel free to relax on your private balcony or freshen yourselves diving into the refined beauty of our Sea Pearl’s large pool during a hot summer day. Swim, take your drink, relax or simply enjoy a daytime recoil. And for the young ones, there is a separate pool where they can splash around as much as they like. Enjoy the kind people, the friendly atmosphere, the sea and the beautiful landscape. Start the day enjoying the coffee and the delicious breakfast offered by the Sea Pearl, on your spacious private balcony, whilst admiring the morning sun and the relaxing atmosphere of our garden. 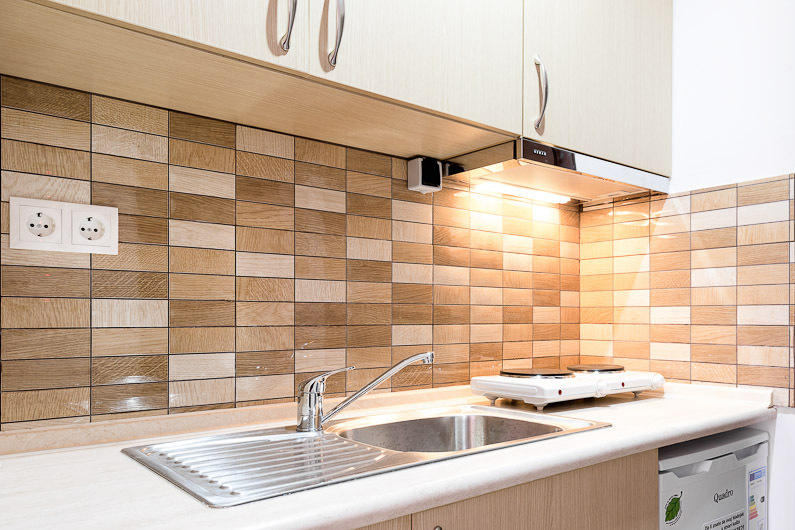 Prepare meals in your own time, using your private and fully equipped kitchen. Enjoy the endless, charming Nea Vrana seaside foot-walk or get fun at the numerous beach bars and clubs. Take some time to relax while swimming or sunbathing or play some beach volleyball and many other beach / water sports along the endless, golden sandy beach, just in front of your Sea Pearl studio. Guided by our dedication to our guests’ comfort and leisure, we have created an ideal environment for the discerning traveler. We offer services to the guests so that their stay is comfortable, pleasant and safe from their arrival until their departure. 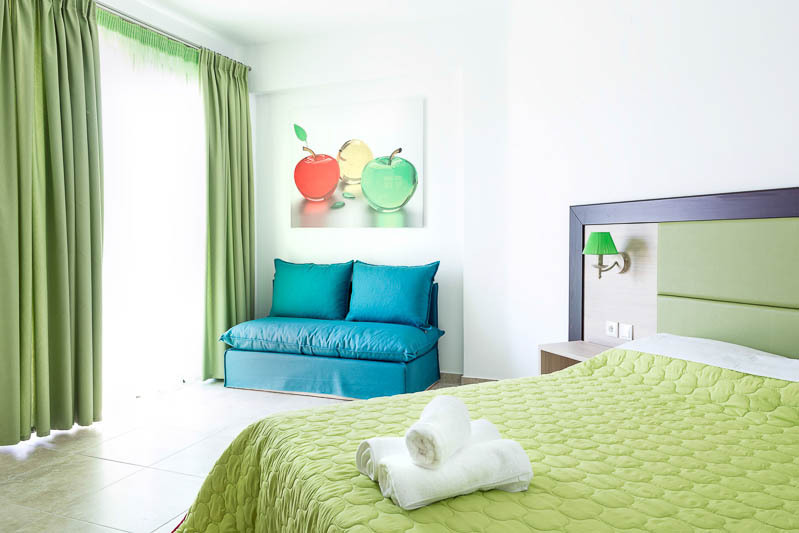 Discover the Greek hospitality and enjoy a very pleasant holiday experience at the Sea Pearl studios, in the beachfront village of Nea Vrasna! If you cancel your booking 30 or more days before the date of arrival, your deposit will be fully refunded. If you cancel in less than 29 days before the date of arrival, your deposit will not be refunded. In case you decide to leave before your scheduled departure date, you are requested to pay 50% of the remaining value of the days for which you were scheduled in accordance with provisions in law. Since we have confirmed availability for your preferred dates of stay and in order to complete your reservation at Sea Pearl apartments, it is necessary that you provide a deposit of 30% of the total cost of your stay by making a deposit to our bank account. The remaining balance is to be paid after your arrival at Sea Pearl apartments. Nea Vrasna village is part of the Municipality of Agios Georgios (Saint George) that also combines Asprovalta village and Ano Vrasna which is the old Vrasna village. The population of the Municipality has reached 6.500 people in the last few years; however, during the high touristic season, it raises up to 50.000 people. 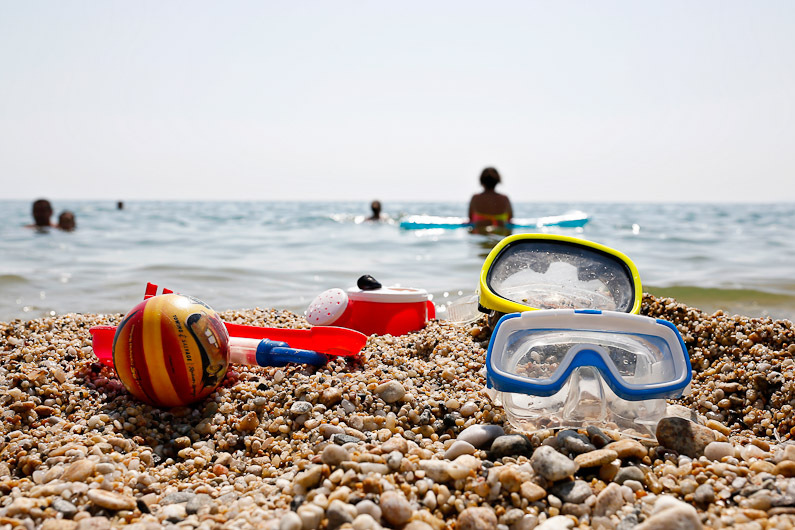 The beautiful and clean shores fulfill all requirements that make the sea appropriate for swimming and have been awarded with the Blue Flag every year, since 1989. The visitors can find themselves leaving the beach and soon enough resting in shadowy places of mountainous landscape, hiking through picturesque routes. Entertainment in the Municipality of Agios Georgios satisfies the demands of every single visitor, with a variety of choices among cultural events, excursions, hikes, night-life etc. The visitor can also enjoy all kinds of sports, choosing among swimming, wind surfing, ski, tennis in our two new courts, beach volleyball, basketball in outdoor and indoor courts, football in 5×5 mini courts and sailing. The wonderful quiet position, the short ways to the beach and the rest points of interest, are good reasons for you to visit us and enjoy pleasant and restful vacations at an ideal location. Being no more than 90 meters away from the beach, our apartments allow easy access to most of the local hot spots. Local shops are close at hand, with a selection of tavernas, restaurants and bars laid out along the sea. 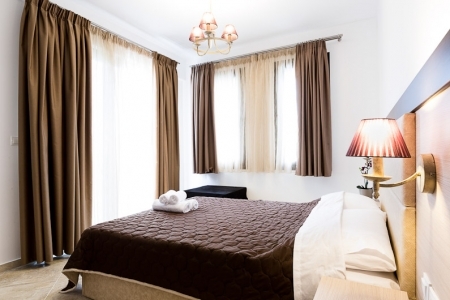 This alluring environment is within easy reach of both the city of Thessaloniki (77km) and the “Macedonia” international airport of Thessaloniki (81km). U ovim luksuznim apartmanima smo boravili 2 nedelje, i svima bih preporucili da posete Sea Pearl. Smestaj izuzetno lep, cist i uredan. Sve je bukvalno novo i mislilo se na svaku sitnicu. Vlasnici su neverovatno gostoljubivi, profesionalni i uvek ce vam izaci u susret. Jednostavno, ovakav smestaj necete naci nigde na potezu od Asprovalte do Olimpijade. Za svaku preporuku, i ko jednom dodje, siguran sam da ce se vratiti opet. Sve pohvale!!! !